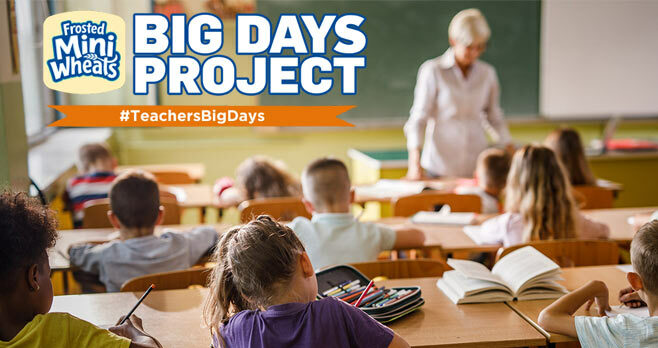 Nominate a teacher in your life during the Kellogg’s Frosted Mini Wheats Teachers Big Day Sweepstakes and they could win a Teacher Appreciation Package valued at $500 each. Eligibility: The Kellogg’s Frosted Mini Wheats Teachers Big Day Sweepstakes is open to legal residents of the 50 United States and the District of Columbia, age 13 or older at the time of entry. Promotion Period: The Sweepstakes begins at 12:00:01 AM ET on Wednesday, August 08, 2018 and ends at 11:59:59 PM ET on Monday, September 10, 2018. Limit: One Online Entry per person regardless of whether Entrant has more than one email address. Prize(s): The grand prize consists of one (1) Personalized box of Kellogg’s Frosted Mini Wheats, a $400 prepaid card, and a $100 school supply package.